"Look into my eyes and tell me you love me." Buspirone is a love potion. You've had it with your cat spraying urine and stinking up the house, but don't think you can stop it instantly. Your vet can prescribe off-label a medication that helps eliminate spraying. It won't stop spraying on Day 1, but if you're patient, it might help do the trick. Along with buspirone, Puffy needs behavioral modification. Marketed under the name Buspar, buspirone was developed as an antidepressant for people. The U.S. Food and Drug Administration allows veterinarians to prescribe it for off-label use. It's one of the most effective medications to stop inappropriate elimination in felines, but you must give it to your cat for a few weeks before you see the effects. Once your cat stops spraying urine, he's unlikely to start again when he's taken off the drug. Buspirone is available in tablet form. Your vet might prescribe a 5 milligram pill twice a day for the first week. If you don't see a response, your vet might up the dosage to 7.5 milligrams twice daily for a week. If your cat still isn't responding, it's likely buspirone isn't the drug for him. However, if the larger dose does generate less inappropriate elimination, your vet might wean your cat back to the 5 milligram dose twice a day for a week. 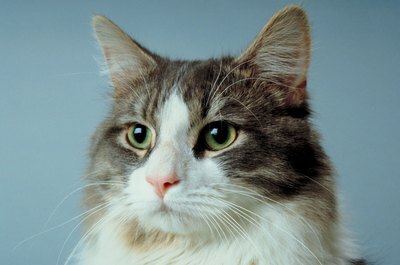 If your cat continues to eliminate appropriately, he'll stay on the medication for a total of eight weeks. Buspirone doesn't produce a lot of side effects in cats, while one particular side effect isn't necessarily a negative: Some cats under the influence of buspirone become inordinately affectionate. It's like a kitty love potion, and a cat might get to the point whereby he's a pest. According to VCA Animal Hospitals, some owners complain that they can't sleep "due to aggressive purring and rubbing by their cat." The flip side is that some cats develop aggressive behavior. Other side effects include lethargy and appetite loss. In conjunction with the medication, other measures help prevent your cat from spraying. The first step is having your pet fixed if he's not already -- a female is less likely to spray than a male; a neutered male usually sprays less, particularly if he's altered earlier in life than later. Another measure is to provide at least one litter box for every cat in the house, and keep them scrupulously clean. Some cats don't care for covered litter boxes or scented litter, so see if making simple changes one at a time helps the situation. According to the University of Pennsylvania School of Veterinary Medicine, cats who eliminate in the tub or shower might show a preference for open places to pee or poop. Carefully clean the areas where your cat sprays using commercial odor eliminators. Before your vet prescribes buspirone or any other medication for elimination issues, your cat should undergo a thorough examination to rule out any physical reasons or illness causing him to spray.